and ready for those looking to add some fright into their lives. On the site of a former funeral parlor sits Daydreams & Nightmares, a fitting location for a shop that deals with the paranormal right alongside the normal. Dana Walters’ store on 7th and M St. in Modesto is a costume shop, and that is a large part of her business, but it’s also a spot for Halloween stuff, a mini horror museum, a make-up parlor, and a magnet for ghost hunters and those interested in the supernatural. Strange and unexplained occurrences have prompted many to believe the property is haunted. Surveillance cameras have caught white orbs floating and zooming outside the front entrance well after closing, but inside is where the creepiness is magnified. There are scores of recorded incidents, which have happened all over the store. In the make-up and mask display room, Walters says that behind the counter is where the funeral workers would wheel the caskets to the back room. In the back of the shop, the eldritch evidence is tangible. That’s where the crematorium and old embalming room was, and what’s even more unsettling is the fact that the ashes from the dead are still visible on the ceiling. A spiritual man advised that they not paint over the ashes, for to do so would trap the spirits, and anyone familiar with horror films knows that when a spiritual guru opines, you had better abide. The spectral activity here is so common, Walters says, that it’s simply become a part of life here. But despite that, there is still a business to run. 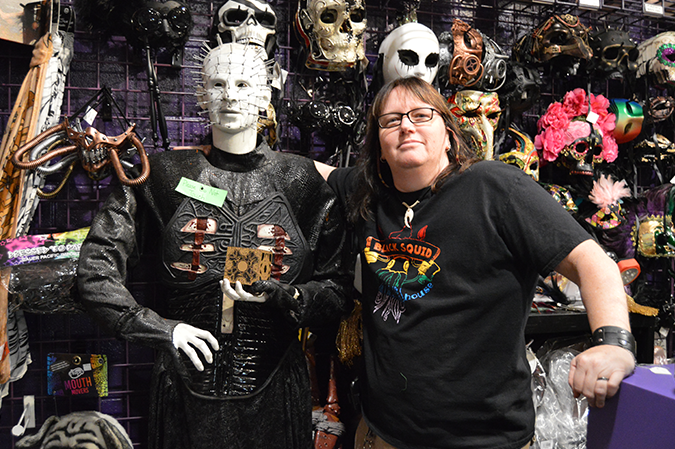 In a tall glass case is a new addition to the store called “oddities,” courtesy of an artist she met at a convention. It’s full of assorted sea creatures and small animals done in the style of taxidermy. Only, these aren’t stuffed. They’re designed so guests can see a sort of fossilized version of say, a pig fetus, or a turtle, or an octopus. Back in the store, the masks of clowns, demons, and twisted animal faces await. And, if guests need a make-up job for any occasion, Eva, who Walters jokingly calls “the paranormal advisor,” can fix them up. Whether guests want to check out a signed Linda Blair head (the signature is just below the dribbled pea soup), or if they need Halloween goods, a corroded zombie face, a fossilized octopus, or if they’re a skeptic who wants to test the paranormal, Walters is ready to welcome them in. Costume rental for all occasions ranges from $45-$100.